Join us to where the Lord has led this Holy Week. Kathryn B. & Christopher C.
Help us prayerfully reflect on our parish, by completing the survey below. Specific answers are most helpful. May God continue His good work in our midst. May St. Rita continue to pray for us. This Lent St. Rita commits to doing good, being Partners in Alms. Sign up for any individual day or get more information from our Church Office (504-866-3621). We unite ourselves to added Prayer, Fasting, and Almsgiving during Lent. We do this personally and as a community, with additional opportunities at St. Rita. Join us in Following the Lord’s Road this Lent. 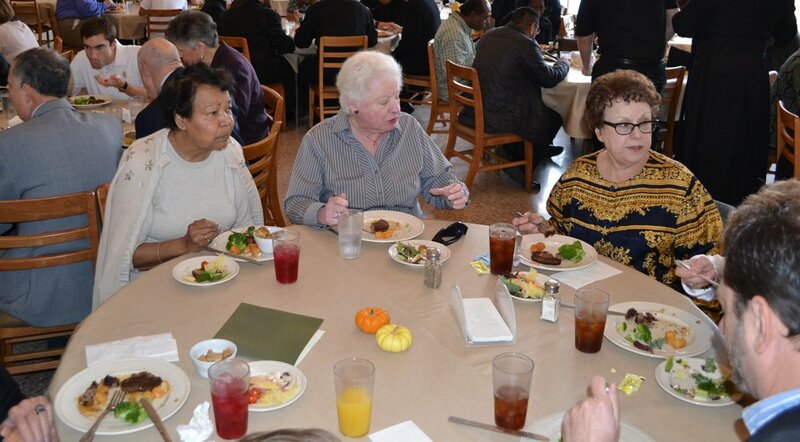 In partnership with GladeWaves, St. Rita is beginning a Monthly Dinner Series for our St. Rita Seniors in the Moreau Center. There is no cost for the meal, and each will feature a dynamic guest speaker. Please sign up to reserve your spot. There is a 50 person limit per event. Mike Carbo on the importance of having affairs in order and how to do it without an Lawyer. Importance of having a living will and medical power of attorney. Camellia Williams from the Counsel on Aging on Medicare changes. Next Friday, February 22nd, St. Rita’s Parish and School Youth Group returns! 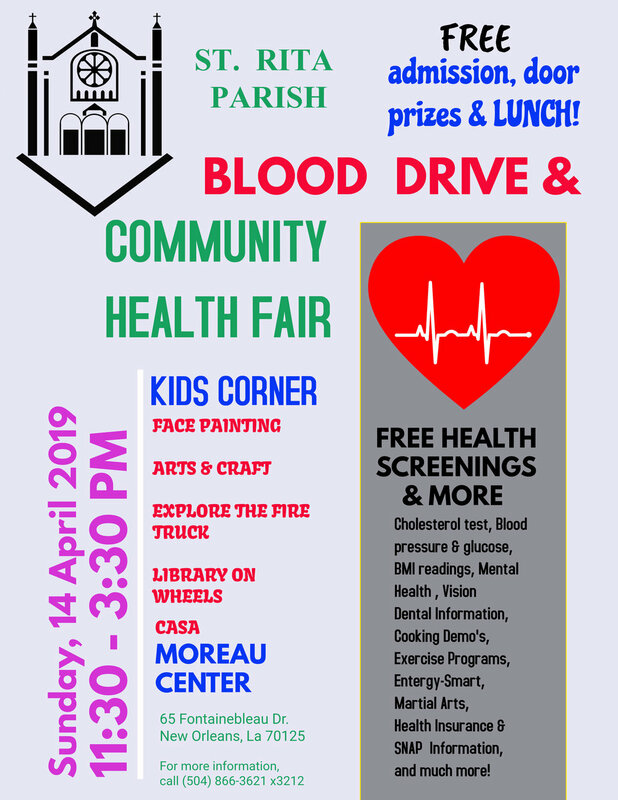 All 5th, 6th, and 7th graders from the parish and school are invited for faith, food, and fun from 5-6pm in the Moreau Center (school cafeteria). Help us build this important group. While we New Orleanians generally figure our date of Easter by the celebration of Mardi Gras, the movement is actually reverse -- today and historically. In the earliest times of Christianity, those preparing to enter the Church in liturgical celebrations of Easter intensified their prayer and practices during the days closest to Easter. Thus, Lent with its symbolic 40-day period began by those going through an ancient RCIA-like program, and those believers already initiated into the Church similarly kept Lent as a support to those preparing to join their community and as a way to personally recommit themselves to the faith. In turn, Catholics began preparing themselves for the penitential season of Lent by enjoying the many blessings they had received, giving birth to Mardi Gras, a festival period beginning on Epiphany and culminating with "Fat Tuesday." The older -- and still current -- title of this period is instructive: Carnival. Carnival is actually an anglicization of two Latin words, carne vale. Catholics, then, literally offer a "goodbye to meat or flesh." Rather than a hedonistic display of all possible excesses, Mardi Gras or Carnival is our common enjoyment of friends, food, and creation. It is only through truly knowing these things can we know what we are actually giving up in Lent. There are, of course, certain excesses on display, requiring an appropriate celebration to always be the goal. Archbishop Gregory Aymond has offered some help in this regard, penning both suggestions for parents and children for the Mardi Gras season. Not convinced yet about the Catholic necessity of the celebration? Famed 20th century German theologian Karl Rahner was even taken by the feast, noting the importance of laughing with creation. Read his reflection on a feast far from his native Freiburg, but close to his heart. Finally, don't forget to get your routes and dates and times straight! Patience is a virtue to develop, but there is plenty of opportunities for it without creating it yourself. Get all your parade info here. Our St. Rita School Color Guard and Cheerleaders will march in a number of school parades and in Metairie’s Little Rascals on Sunday, February 17th and New Orleans’s Choctaw on Saturday, February 23rd. Fr. Peter will again take up his role as Chaplain of the Krewe of Thoth, celebrating the krewe’s Mass (8:30am in the riverfront Hilton, if you’re looking for a lively downtown Mass) and riding in the parade. Sunday, March 3rd, Float 9 (“D Day”), neutral ground side, top, last rider. I’m usually throwing to the back, so yell loud! Exciting things are in the works for our St. Rita Seniors! 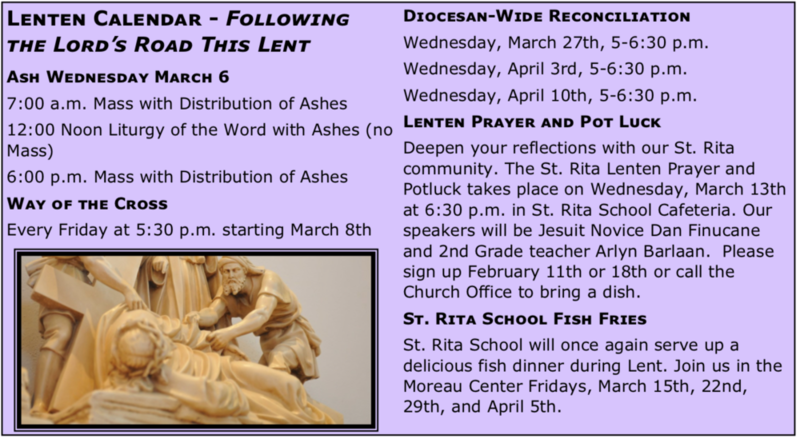 If you are 50 or older and have been looking for an opportunity to join fellow parishioners in faith and fellowship, please come to our St. Rita Senior Kick-Off Friday, February 15th at 4:30pm in the Moreau Center (school cafeteria). Posh Paint will provide canvas and and paint (and suggestions), and St. Rita will provide a main for the meal. The cost is $5; side dishes are welcomed. There will be plenty of parking available -- and an exciting announcement about future gatherings! Reserve your spot via email or calling the Church Office (866-3621). Married, single, widowed, religious...there's a spot for everyone! How is God inviting you to serve? 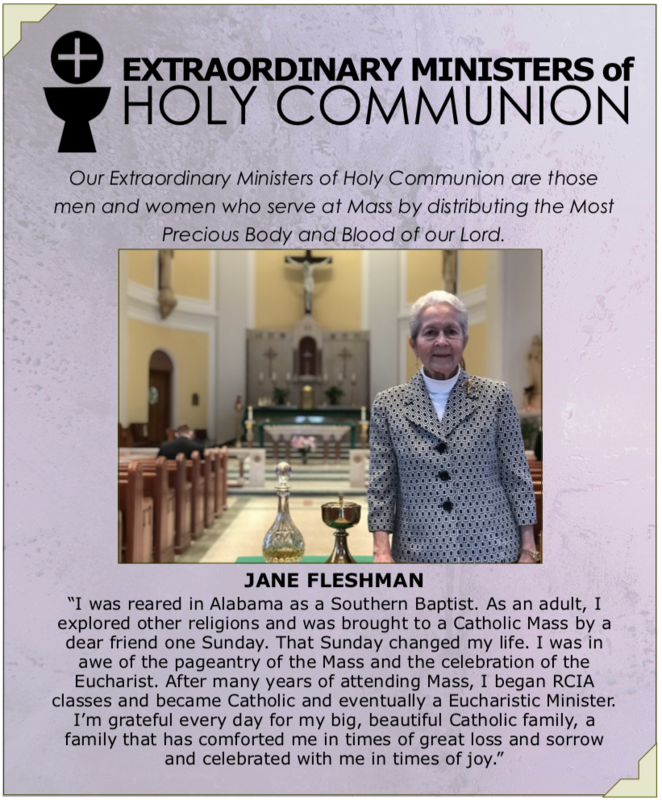 In February our Ministry Focus is Extraordinary Ministers of Holy Communion.